Monaco is one of most charming and enjoyable multiplayer games we've played in a while. There's something here that should appeal to almost any gamer, and there's really no reason to not pick this one up. I’ve been waiting for Monaco for seemingly forever. The game wow’d everyone in attendance of the 2010 IGF awards, and it really wasn’t surprising that it came away with the grand prize. But then, it seemed to have all but vanished, and had I not known better, I would have thought it was another hallucination brought upon through years of me making poor life decisions. It wasn’t until a few months ago that it seemed to pop back up on the radar with the promise of a Spring release. Well, as of today, Monaco is available on both XBLA and Steam. Was it worth the three year wait? Read on to find out. 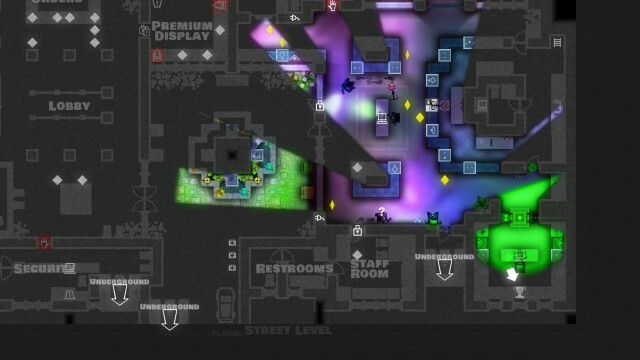 Monaco is a top down stealth game with a focus on thievery. You’ll take on the role of one of eight characters as you break into high security areas in your own personal version of Ocean’s 11. Each of the characters has a certain ability to help you get through a stage a bit easier, and a big part of the game is learning who you’re most comfortable playing with. 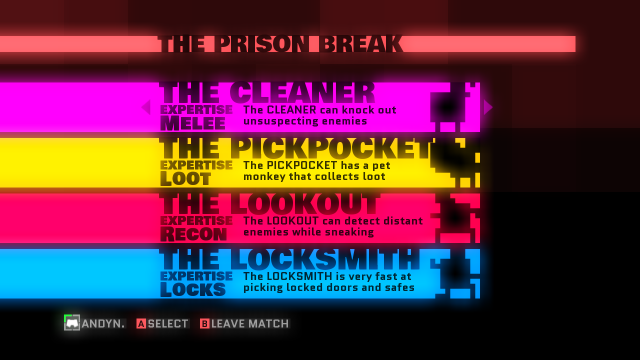 The Locksmith can crack open safes and doors in half the time it would take another character, while the Pickpocket has a pet monkey that will silently grab loot in your general area. There’s no “wrong” way to get through a level, and a large portion of the fun is finding out how to utilize each class’s strengths in a specific situation. While Monaco‘s graphics are fairly downplayed, it’s one of the most aesthetically pleasing titles I’ve played recently. The subdued graphical style seems like it would be from somewhere in between the 8 bit and 16 bit era. 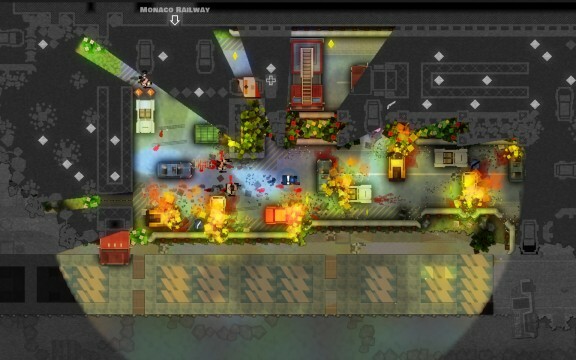 While most stealth games revolving around thievery focus on a gritty experience, Monaco’s colorful pallet is borderline cartoonish. 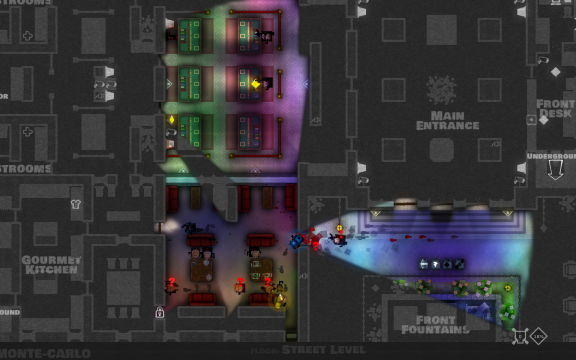 From the darkened high security rooms to the bright lights of the dance floor, each level manages to convey its own story through its scenery. When your line of sight is blocked, instead of just seeing a black outline of rooms you’ve already seen, you’ll instead lay eyes on a blueprint of the room’s layout. Everything in Monaco is simply charming. Dead enemies leave behind a cartoonish skeleton while dead players leave a chalk outline, giving you an absolute reminder of your failure. The ragtime piano music does a fantastic job of invoking a playful feel in the game, and having it speed up when you’ve been spotted was a stroke of genius. It seems like such a subtle touch, but turning a stressful situation into something out of a Benny Hill sketch helps keep it from ever becoming frustrating. The controls are incredibly simplistic, but feel perfect for the given task. Playing the game on my PC, I largely stuck with my mouse and keyboard and felt like it was perfectly suited. Movement is done with the traditional WASD keys while the mouse handles sneaking and using your items. I did plug in a controller to try it out that way and felt it controlled just fine that way, so I don’t really think you can go wrong with either option. The story is told through a series of text based cutscenes before each mission. While it’s not the most engaging storyline I’ve ever come across, each of the classes injects its personality into the dialogue, which makes it come out as pretty endearing. I really can’t think of a better way to describe it outside of a cartoony version of Reservoir Dogs. While the game does have a branching storyline, this ends up being one of the first flaws I’ve found with the title. When I unlocked the branch in the storyline, I pretty much ignored it to finish out the Locksmith’s story. As you would expect, the last few stages of that story were fairly taxing, and really took a bit of skill to finish them alive. 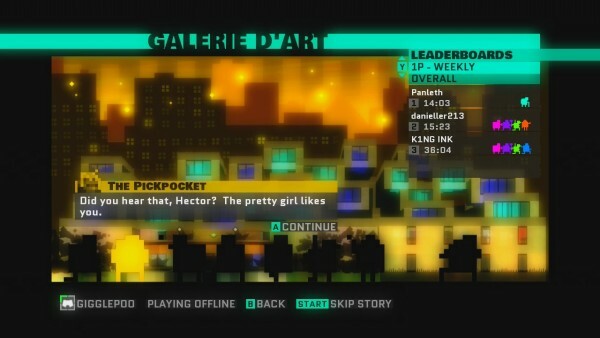 Switching over to the Pickpocket’s story, I was a bit shocked to find that the difficulty dropped pretty significantly. Now, this certainly isn’t a major gripe, but it did take a bit of the luster away from trying new levels when I didn’t necessarily feel the same level of accomplishment when I got through them. I will admit the difficulty did ramp up fairly quickly after that, but that initial shock felt uneasy. The other thing that caught me a bit off guard is that in order to unlock more levels in the Pickpocket’s story, I had to go back and increase my score on some of the earlier levels. This may sound like I’m nitpicking a bit, but I’m generally not a fan of artificially inflated game length. Holding back parts of the game until the player jumps through hoops just seems wrong to me for some reason. It’s not a major issue, and I’m certain that a lot of people won’t have any problem with it, but it’s something that just doesn’t sit right with me. While Monaco was a blast to play on my own, this game was meant to be played with friends. Even with the PC version, 4 player local co-op is available, as well as 4 player co-op over the internet. At this time, I can’t really write honestly about the online co-op since I haven’t seen it in action with the masses, and as a general rule I don’t count press-only multiplayer to be a fair representation of the final product. You’ll have to forgive me for pleading ignorance on it. Check back in a few days and I hope to have this updated with some true hands on experience. As far as local co-op goes, however, Monaco is outstanding. I know I just stated that BattleBlock Theater was possibly going to be my go-to party game for having friends over, and while I still think that will get a bit more play time from my friends and I, Monaco is an absolute blast to play with a few buddies. With four different classes roaming the level, new solutions and paths become available that I never would have thought of before. This is where the game changes from a simple stealth title into an Ocean’s 11 heist, complete with the inevitable catastrophic failure that comes whenever I have friends try to do something skill oriented. I could easily recommend picking Monaco up just for this alone. Monaco is simply fun, there’s no other way to really put it. Everything about this game oozes charm, and it comes together in a near perfect package. There’s really something here for just about everyone: speed-runners have a plethora of challenges ahead of them, and with four trophies based on performance in each level, completionists will have plenty to sink their teeth into as well. I’m already looking forward to the next time I can have a few buddies over, crack a few beers, and hopelessly fail high risk heists. It’s been a plan three years in the making, and it was definitely worth the wait. This review is based on a Windows PC version of the game given to us for review purposes.